Abstract: Objective To investigate the changes in serum levels of pro-inflammatory cytokines and their predictive value in clinical responses to adalimumab(ADA) treatment in patients with rheumatoid arthritis(RA). Methods This study consecutively enrolled 79 active RA patients who received 40 mg ADA every 2-weeks for 12 weeks. 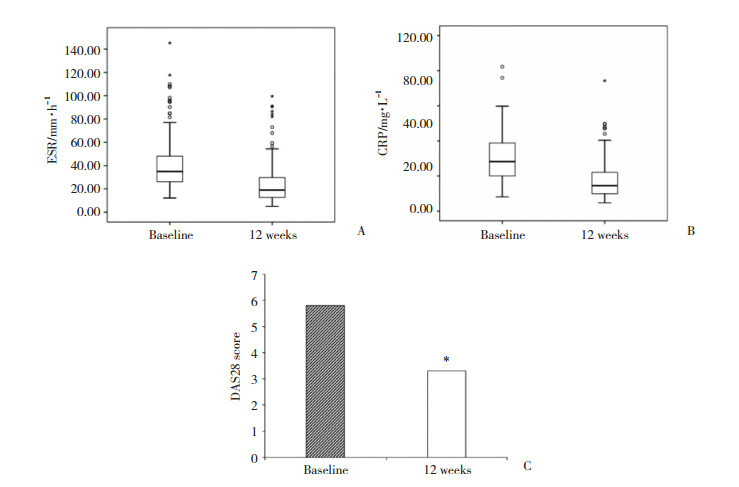 Serum samples were obtained at the baseline and at 12 weeks post treatment. Serum tumor necrosis factor(TNF) α, interleukin(IL) -1β, IL-6, and IL-17 levels were detected by ELISA. Results CRP, ESR, and the DAS28 score decreased after 12-week ADA treatments(all P < 0.001). Serum TNF-α(P < 0.001), IL-1β(P=0.007), IL-6 (P < 0.001), and IL-17(P < 0.001) levels also decreased. 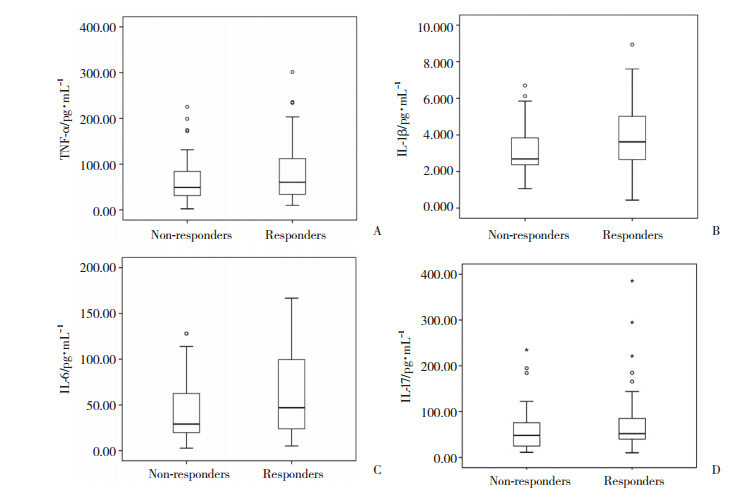 The baseline IL-1β(P=0.088) and IL-6(P=0.092) levels were found to be elevated in the response group compared to that in the non-response group. Univariate logistic regression analysis revealed that high baseline expression of IL-1β(P=0.091) and IL-6(P=0.062) might predict a clinical response to ADA treatment; however, multivariate logistic regression analysis revealed that neither IL-1β nor IL-6 could predict clinical response independently. Conclusion Serum TNF-α, IL-1β, IL-6, and IL-17 levels were downregulated in patients with RA after ADA therapy, and high baseline expression of IL-1β and IL-6 might predict clinical response to ADA treatment. ESR，erythrocyte sedimentation rate；CRP，C-reactive protein；DAS28，disease activity score in 28 joints；RF，rheumatoid factor；ACPA，anticitrullinated protein antibodies；MTX，methotrexate；LEF，leflunomide；SSZ，sulfasalazine；HCQ，hydroxychloroquine.